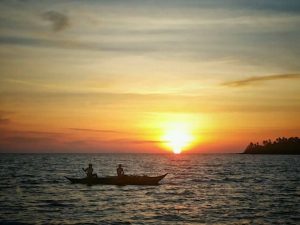 Bagatao Island is situated at the mouth of Sorsogon Bay, in the Municipality of Magallanes. 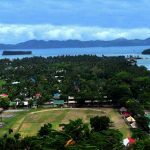 It has a land area of about 543 hectares, about two kilometers from the Poblacion and just a stone’s throw away from the Magallanes pier. 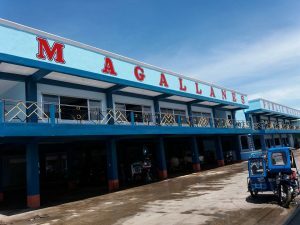 Strategically situated as it is, Bagatao protects the town proper of Magallanes from the onslaught of destructive waves and wind during the southwest monsoon (“habagat”) season and the occurrence of strong typhoons. Raffi Banzuela, a Bikolano author cited in his book Bikol in the Galleon Times that, there were several Astilleros in the Bikol Region in the Spanish time. 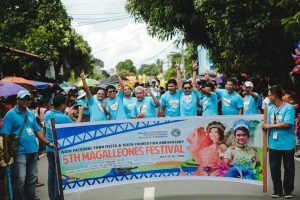 There is one in Dalupaon, Pasacao, Camarines Sur; PantaoLibon, Albay; Dancalan, Donsol, Sorsogon; Bagatao, Magallanes, Sorsogon and Fabrica, Mobo, Masbate. It is believed that the Royal Astillero of Bagatao started its operation sometime in 1609-1610 based on historical accounts attributed to Fray Felix de Huerta (Gerona, the Bikol Galleons, October 10, 2011) who wrote “Dicha isla de Bagatao, donde el Superior Govierno establicio un astillero real… el siguente de 1610 libro el Superior Govierno cantidad de pesos para la iglesia y ornamentos sagrada.” Translated by Rogerio H. Escobal (2006) as “In the Island of Bagatao, the government established a royal shipyard… according to a chapter in a book of 1610, the government gave money and sacred vessels/ornaments for the church”. All astilleros in the Bikol Region were established by Governor Juan de Silva and it is assumed that the Astillero of Bagatao began its operation also at the start of his rule or a year thereafter. The workers were conscripted from Albay and Catanduanes who were described as workers of “unrivalled skills in shipbuilding”. Bagatao but the grandest, swiftest and costliest galleon ever built in the Royal Astillero of Bagatao is the Santisima Trinidad y Señora del Buen Fin(Our Lady of Good Ending) which was built in 1750 and finished in 1751 upon the decree of then Governor General of the Philippines Don Francisco Jose’ de Ovando.This galleon was also popularly known as the “El Poderoso” (The Mighty). She was considered the grandest galleon in the 18th century plying the Manila-Acapulco route for eleven productive years until she was captured by the British frigate Panther in 1762.The British reported that “she was a large vessel, she lay like a mountain in the water and the Spaniards trusted entirely to the excessive thickness of her sides…” in fact, the shots from the Panther did not even made an impression upon any part except the upper works. On board was a treasure to the value of two million dollars, an amount considered a fortune at that time. The capture of the Santisima Trinidad was considered one of the fabulous naval exploits of that era. In 1763, she was brought to Plymouth in England to be sold and where it was said that people came from all over Southern England to gaze upon the mightiest of the galleons which ended her long odyssey of troubles in ignominy of alien captivity. The Royal Astillero of Bagatao also built warships or guesos navios and some of these are the San Felipe and the Santiago (believed to be the first galleons built in Bagatao) which figured prominently in the battles at Playa Honda in Zambales against the Dutch in 1616-1617.Other galleons built in Bagatao were the San Juan Bautista, the San Francisco Javier, the Sta. Rosa, the Sto. Niño, and Sto. Cristo de Burgos. The shipyard, in addition to such galleons and warships also built other smaller sea vessels which were being brought to Mexico and sold for huge profits. 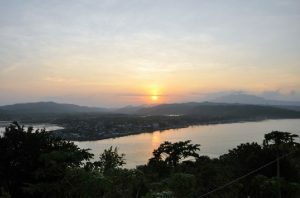 Bagatao also serves as one of the major ports of call for Spanish galleons in their tornabuelta or tornaviaje from Manila to Acapulco and vice versa. They use the astillero for refurbishing of supplies, repairs or as a safe harbor in times of storm or typhoons. 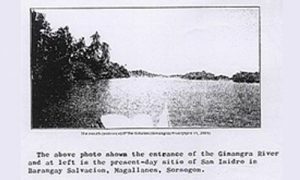 Here they waited for fair weather before attempting to cross the treacherous Embocadero de San Bernardino (San Bernardino Strait)in open sea. is a perfect shipyard with abundant supply of various hardwood such as narra, molave, yakal, lauaan and guisok right in the forest of the island, a strategic harbor, the said place having met the three major requisites for a shipyard which is a safe port, abundant supply of ship timber and cheap or even free native labor. All this talk of grand galleons sometimes make us think that it is all so very exciting and that we must have been celebrated for our superior skills as shipbuilders during that time. It is sad but it was never the case. Our ancestors have greatly suffered in the hands of the Spanish conquistadores and the forced labor which they imposed through the repartamiento under the polos y servicios (forced labor) which is a kind of Spanish tax whereby all native males between the ages of 16-20 years old were required to serve in the public works, including building galleons, for 40 days every year without compensation. An astillero requires no less than 8,000 cutters and haulers of lumbers, although there are Chinese carpenters, the roughest of the works fall on the natives. In addition to the galleon they would also simultaneously build a galiot, a patache, an almiranta or brigantine, all of these act as consorts or escorts of the galleon when its sails to the high seas. In one galleon project alone, at least 4,000 carpenters are needed in the shipyard. From the sheer number of galleons built in the Royal Astillero of Bagatao, you can readily surmise the abundance of the resources hereabouts during that time. There is no way such number of mighty galleons could have been built here in the absence of such resources. Aside from timber, galleons needed a lot of cordage, riggings for the masts must also be provided hence, the Spaniards also mandated the planting of abaca. It explains why abaca is also abundant in Bikol Region especially in the nearby municipalities even up to this time. It appears that everyone in the vicinity of the astillero is tasked to do something for the galleon, as a form of tribute which the natives had to pay the colonial rulers. It also implied that since there is growing demand for abaca fiber, lands that are supposed to be for planting and cultivating food crops to feed the family are used for such purposes and additional areas are also to be cleared in the forest so that they could plant more of it, hence the birth of the slash and burn method of farming or the kaingin as it is more popularly known now. Magallanes one can see only mountains and yet no big trees. And that explains as well, why we are now prone to landslides and flash floods. Rogerio H. Escobal theorized that with the tragic destruction and pillage caused by the notorious Moro raids, over a period of two centuries compounded by the encroachment of cultural scavengers who have come and gone in the area for years, there are no longer left any physical sign, structure or even remnant of any historical significance of the ancient town of Magallanes. There are no artifacts to speak of or physical traces of its glorious past. Escobal mused that if the Spaniards had not established a shipyard in Bagatao, the present generation of Magallanes and Bagatao would have seen, admired, enjoyed and cherished the lush forests and greeneries of Mother Nature. Furthermore, the Moros would not have attacked and destroyed the “antiguo el pueblo de Magallanes” and the “isla de Bagatao” and killed so many inhabitants. The Royal Astillero of Bagatao has somehow sealed the faith of the natives as a subjugated people, divested of their hopes, dreams and futures. Galleon Trade after all is a purely Spanish affair which brought them glory and riches while the building of galleons and other ships are the native’s misfortune. 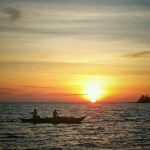 Luckily or unluckily, it was also in Gibalon where the first mass in the island of Luzon was held hence, we were the first to be Christianized and in effect, the first to bear the heavy and oppressive yoke that the Spaniards could sling on the physical and cultural shoulders of our ancestors. But you see how it is with religion, in the midst of all those hardships, the tolling of the church bells were all that the people are sensitive to, to their ears, the peals of the bells are like music that conjures images of an afterlife in paradise where they at last would be free of the endless suffering and oppression. Religion, especially Christianity gave them hope and quite possibly gave them life for without it, there was no motivation of any kind for them to want to live another day in such an oppressive situation and environment. over all adversities by the natives of Magallanes? Are we just going to allow the winds to blow the memories of this town’s glorious past, the slivers of its soul to drift away to far away shores way beyond our reach? Are we just going to content ourselves in reading the historical accounts of foreigners and of people from other places telling us who we are or what we used to be? Indeed it is true, history is written by the victors and because we are the subjugated one, there is not much that could have been done. We were judged by the world according to the accounts of our captors… but that was over 400 years ago… there is no more need for our souls to remain chained and captive of the past… it’s about time that we take charge of the writing of our town’s history, it is the responsibility of this government, the academe, and the officialdom to see to it that the new generation gets our history right as it should be. It is perfectly understandable why some people may choose not to dwell too much on this particular period of history. Maybe they have not yet come to terms with the anguish or the shame or maybe they do not want to be reminded of how they used to be under the Spanish colonial rule. But history is history. It is not something that could be changed to suit certain purposes. We could not escape who we are, what we have been and what we have been through as a people. There comes a time when one has to make peace with the past, accept, embrace and honour it for what it was and what it did to us, after all, we are what we are because of it. There must be no shame in learning those bleak and dark period of our forebears, instead we should be proud that we are Bikolanos, Oragons, descendant of a valiant, honorable, noble and elegant race whose resilience and indomitable spirit withstood the test of time.